The last Winter Olympic Games were held in Turin, Italy. Shizuka Arakawa won the country’s only medal, a gold, in women’s figure skating. Athletes representing Japan participated in all but one of the 2006 Olympics’ 15 sports, with Ice hockey the only exception. The 2010 Olympic Games will begin in 5 days time in Vancouver, BC, Canada, and there will be 95 Japanese competitors competing in 14 events. So Japaners, what’s your favorite Winter Olympic event? I’m partial to the Giant Slalom and Curling. How will Japan do this time in the ever-so-important medal race? Will the country bring home more than 1 medal, or will it fall short of expectations again? Will the athletes show their samurai pride? Tune in to www.crazygaijin.com for regular 2010 Winter Olympic updates and for an up-to-date medal count. Let’s hope I can still remember how to count past 1. Thanks to my exclusive on the ground reporter I can bring you pictures LIVE from Cypress Mountain, Vancouver, BC, Canada. We also have videos but unfortunately my WordPress Host only supports a max of 8MB’s per video and most of our videos are closer to 75MB. Once I figure out a work-around to this problem I’ll get the videos up also. 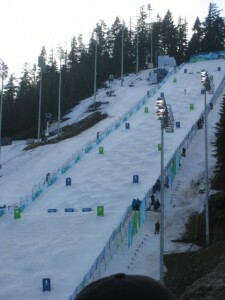 These show the Mogul competition run itself and the male Canadian competitors silver medal run. Enjoy and we will provide more updates as the 2010 Winter Olympiad continues. I’m pulling for Akira Sasaki to take home the Alpine Skiing Gold! He’s a good friend so that makes it even more exciting to watch. Hey Billy that’s great. I hadn’t heard of him before but I’ll keep an eye open for your friend in that event.